Raven’s Head Press has released Alexandra Holzer’s Ghost Gal: The Wild Hunt, a novel by Bobby Nash for immediate purchase as an ebook for the Kindle on Amazon. Alexandra Holzer’s Ghost Gal: The Wild Hunt by Bobby Nash is the first book in a series of new horror/adventures novels from Raven’s Head Press. Listen to Michael, Alexandra, and Bobby discuss Ghost Gal on ESO episode 184 where they also braved The Geek Seat. You can hear it here. 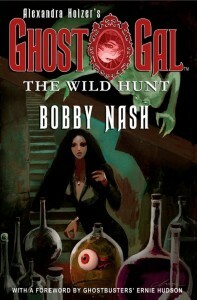 Up next: Ghost Gal Book 2– “A Haunting We Will Go…” by Bobby Nash. ALEXANDRA HOLZER’S GHOST GAL is available from Amazon, Books-A-Million and CreateSpace. For more information on Bobby Nash please visit him at www.bobbynash.com, www.facebook.com/AuthorBobbyNash, www.twitter.com/bobbynash, www.google.com/+BobbyNashAuthor, http://instagram.com/bobbynash14, and www.pinterest.com/bobbynash, among other places across the web.